At a time of fierce political divisiveness, From Here to Security is a refreshingly balanced, non-ideological guide to solving what may be our nation’s most pressing policy challenge: achieving retirement security for all. A pioneer of the 401(k) system, Robert L. Reynolds eschews radical calls for throwing out the 401(k) entirely and creating a new government-run savings system. Our best course, he shows, is to build on what we have: a flexible, dynamic private-public system of Social Security and more robust workplace savings. 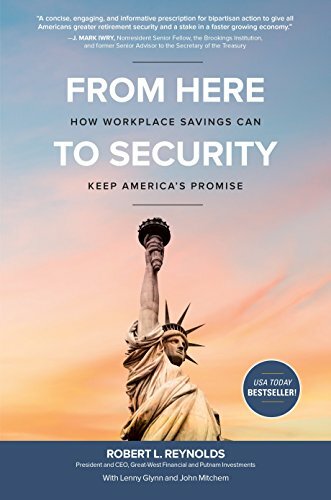 From Here to Security provides a clear, powerful new approach to solving America’s retirement challenge – based on facts, data, and Reynolds’ decades of experience. While fear-mongers claim that the U.S. retirement system is on the verge of collapse; Reynolds shows why our system is actually the envy of the world. But From Here to Security is no status quo book. Reynolds lays out an action agenda to dramatically improve our retirement systems – public and private – lift our savings rate, improve people’s retirement prospects, spur faster growth – and reboot America’s national morale.